Bear Graham E-Juice is absolutely dominating the market with their amazing and one of a kind flavors. These vape juice blends are simply just some of the most defined flavors that we have ever seen. When we see something we like, we know that a hand full of customers would enjoy seeing the same products as well. 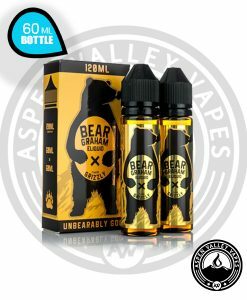 If you are not sure as to which flavors by Bear Graham are worth seeing, check out all of them! However, let us be the first to recommend Grizzly. This flavor is a perfect real world representation of delicious Graham Crackers dipped in Strawberry Jelly and Honey. What more could you ask for from such a delicious blend of flavors.